Now that summer is in full swing, it’s always nice to have to an outdoor space you can enjoy. I love sitting outside when it gets cooler in the evenings. Although my toddler would prefer to be out there all day every day! I don’t do a ton for my back deck, but it only takes a few things to make the space look put together. I found these 10 things from Amazon that would make up the perfect modern farmhouse patio. I’ve been spending a lot of time lately making mood boards. I love finding awesome stuff on the good ol’ interwebs and putting them together to make a “look”. I think you’ll be seeing more of this kind of thing from me, so I hope you like it. If there’s anything specific you’d like to see in the future, please let me know. For this one, I’m loving the black and white mixed with the wood tones and coziness of the farmhouse details. And I love that everything can be mixed and matched. Those black stackable chairs are my absolute favorite – and the price isn’t too bad either! Combined with a that modern pillow and blanket, you’re ready to cozy down and enjoy your summer nights! Last year, I made the mistake of going the whole summer without any sort of table. I don’t recommend that. I was constantly trying to keep track of my drink or keep it on my lap. Good thing there are so many cute ones to keep you from making the same mistake! A table is also a great way to get in those nice wood tones. I love this coffee table but unfortunately it’s sold out (here’s a similar one) and this farm table is super cute if you have room for a full size one! And you can’t go wrong with a neutral rug. This one is only $39! The white metal chairs are also stackable, so they’re easy to store and I love that you can quickly wipe them dry after it rains. Also you wouldn’t believe the difference switching out lighting makes if you haven’t tried it before. This black outdoor light will fit with any style, so it’s a safe bet, and more stylish than a lot of builder grade lighting (what we got stuck with!). Then finish off your space with these planters and galvanized buckets (perfect for filling with ice and drinks!) and you’ve got a total patio makeover completed! If you’re looking for some DIY projects to spruce up your outdoor spaces, try this DIY planter design. It was so fun to make and compliments modern decor so well! 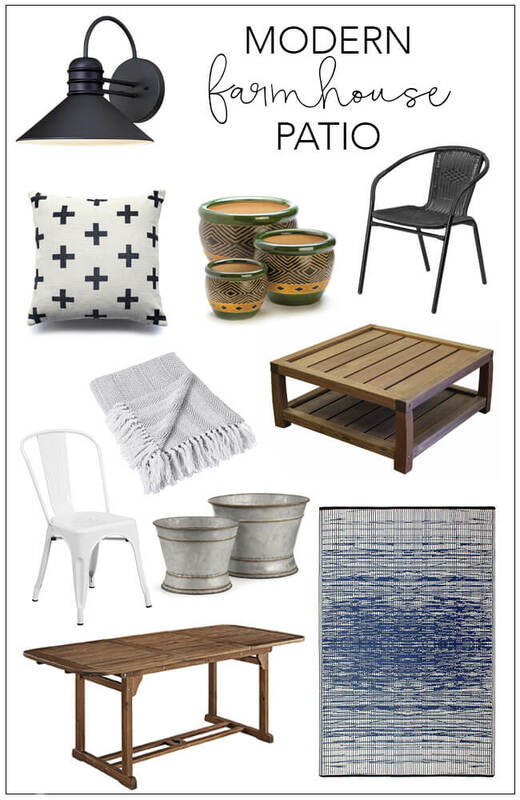 I really liked these pieces for modern farmhouse patio. These are amazing. Thanks for sharing.